I really like doing these Small Studies and feeling good about making a very teeny, tiny dent in my fabric stash and trying out various new screens, paints and techniques. 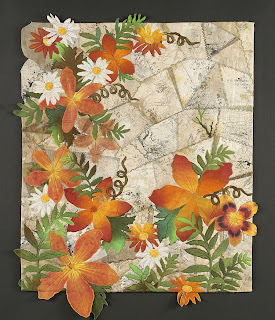 I just finished one using leftover digital imagery from the Windows quilt which is almost done - love those leftovers too! I pulled out a some fabric for my next study; I like some of the fabric (if not all) to be something I made. In my marbling days, I did a lot of tissue lame - a hard fabric to marble but worth the effort. It really has a lot of energy and I'll probably quilt it following the marbling lines. I paired it with the blue silk noil which is very quiet and a good side-kick for the marbling but think it needs something else. Think this hand-dyed purplish color might do the trick. Yup!! think it's good, off and running again. Stay tuned to see what it becomes. I'll be curious also. The signs of Autumn are here - that "goldeny" look the sky gets, cooler nights and almost, not quite but almost fireplace weather. I can hardly wait. I love our veggie garden but the only thing left are the tomatoes. Many of the flower beds are dying off including my happy Sunflowers. I took pictures last week and am glad I did; they're now gone. I'm not disappointed; I love the fall and all that comes with it - so one more look at the Sunflowers. Goodbye to summer and welcome fall. This was the Sunflower garden behind the veggies; each plant was a different variety. The bees seem to love these flowers. This is how I remember Sunflowers with the large brown centers. Love these - so many varieties I had never seen. I saved my favorite for last. I love those big, luscious centers so thick and bright. Hope your summer was a great one. Sometimes you find a piece of fabric in your stash, hidden away and have no idea where it came from. I make most of my fabric using surface design techniques - some good, some not so good, and some I love but they get lost in the shuffle somewhere. Here is one of those LITS pieces (lost in the shuffle) dyed, clamped and Shibori dyed, discharged and stamped. I'm not an "orange" person, but really liked this piece (detail below). It was a small piece so I chose to use it in one of my "small studies". I put black next to it and liked the way they worked together. The orange reminds me of a sky at sunset and since I love trees, thought of using them in the foreground. Creating these small studies are fun as they go together pretty fast, and the best part - you can try a new technique without investing too much time. 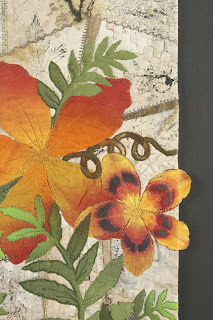 To preview fabric combinations, I hang them on my wall and use a mat board to isolate them. I use the same size opening that will be used in the finished piece. This gives me an idea of proportions. This combo doesn't have enough black for what I want to do. 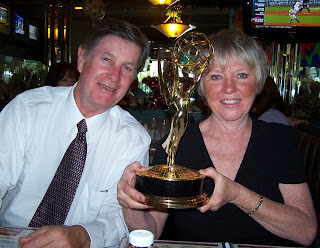 One very gloomy day, John (hubby) and I took a ride. 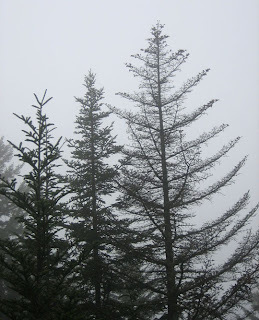 It was magical to see forest and trees in the midst of fog and gray skies. This is one of the pictures I took. I liked the silhouette of all the different size trees and their lacy branches. I put the pictue in Photoshop and made it into a photocopy. The photocopy had to be recopied on a lazer printer so off to Staples to do that. In order to run it through a Thermofax, you need to have a toner with carbon in it which ink jet printers don't have. Here is the screen I made on my Thermofax. I planned to screen the entire image on the black and orange. I wanted it to be continuous; the black side would be discharged and the orange side would use paint, probably black. Here is the finished piece! Our PTA group met today. It's always great fun, lots of eating, talking, planning and sharing. Connie received a vintage apron from Mary Berry - just because. Connie loves aprons, always wears them, kind of reminds me of "June Cleaver" except where are the high heels? and the official "1966" on the front and a hidden pocket underneath! Georgia Bonesteel and Charlotte Warr Anderson run a retreat each year in Montana. Both have wonderful styles and each very different from the other. Every student has the opportunity to take both workshops. Georgias project for this year is very cool. I love the way she did the "M" for Montana. I think students will really enjoy making this and how lucky we are to have a first hand look at it! 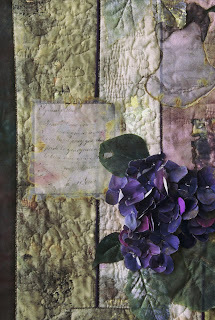 Gen Grundy is doing a crazy quilt for her daughter using silks, velvets and gorgeous stitching. I love what she's done so far and look forward to seeing the finished piece. The machine stitching is just beautiful on each one and every block so unique! Gen is a master at machine work as well as using the embroidery unit on her machine. As always, a great group, so much fun and talent to be surrounded by. I am so lucky, thank you gals for a great day! Voila! It's really quite pretty, has a variety of vine type flowers most of which only bloom in the morning. I think this would be really funny with a "top hat" on top of it! This is one of the vine type plants growing up the tepee called a "Love in a Puff". They are little puffs and when opened, there's a seed inside. Peel away the outer part of the seed and there's a heart shaped part to the seed, how clever. I wonder who thinks of these names! and the Dahlias are really beautiful right now, some the size of a dinner plate - almost! Hope you're enjoying this beautiful weekend! John C Campbell Folk School is nestled in the quaint little town of Brasstown, NC, surrounded by mountains and mountain culture. The school offers weeklong and weekend workshops in a variety of crafts. Taking and teaching weeklong workshops is always a joy because of the indepth approach to subject matter in an environment conducive to creativity. I am lucky to be teaching there this fall - September 13-18. I'll be presenting the following workshop - Nature to Paper to Fabric. 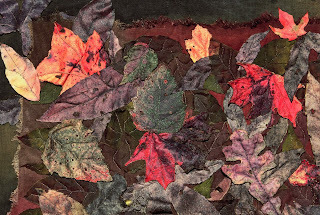 Years ago, I developed a technique for duplicating leaves onto fabric. It developed as a result of trying to recreate the beautiful fall leaves I collected each year but couldn't quite capture on fabric. 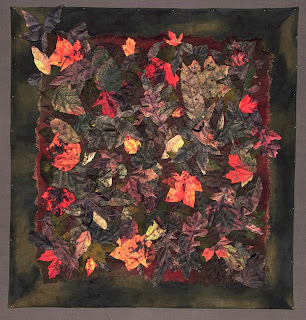 This quilt, part of a series that resulted from that technique is "Natures Images - Autumn". For this piece, I created all the leaves using this technique. and a detail - the leaves are identical to the real leaf, only difference, mine don't die. This technique can be used in so many ways. 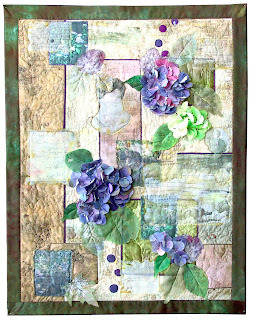 "Nature Images - Hydrangeas" used real petals from Hydrangea flowers to create the quilt below. 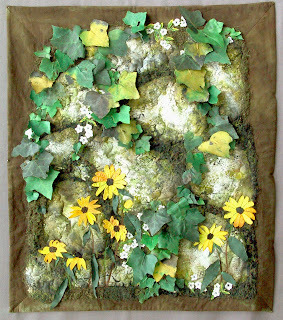 This next piece "Natures Images - Summer" used real leaves mixed in with fabric appliques. 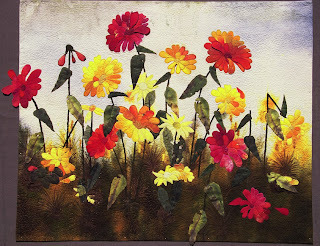 In "Natures Images - Daylilies", real daylilies were used as a transfer to fabric; the rest of the piece used hand-dyed fabric. The flower on the right is the real thing" - left is hand-dyed fabric; both mix well together. 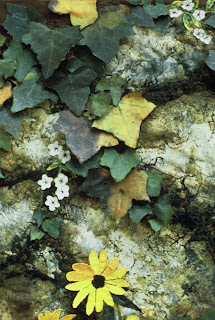 Natures Images - Country Walls" used real ivy transferred to silk. The rocks were made from muslin and canvas which I painted and stuffed in areas to give an uneven-ness to the surface, more like a rock. It's a wonderful school, great food and lots of fun activities besides the workshops. Hope you'll consider joining us. To see more of my work, please visit my website. As one quilt show comes down, another goes up. We are so lucky to have this wonderful venue at our fingertips, the NC Arboretum. Year round, they feature quilt exhibits from various groups or persons within the local quilting community. They just hosted the Asheville Quilt Guild quilt show, it came down on Sunday; now it's Tuesday and the PTA is hanging a quilt exhibit upstairs. The PTA have an exhibit which opens today and runs through October 5th. Here is a peek at what you'll see. This is Mary Berry's wonderful piece - "Enough is as good as a feast"! Mary Stori's beautiful work, her newest love - working with wool felt is titled "Bamboo Sunset". My piece created for a challenge using "transparency" in some form, features Shibori tea bags made out of sheer silk organza, wrapped and dyed with acid dye to create the stripes of Shibori. It's called "Shibori Tea Party" (there's real tea in those bags!). I love Linda Cantrells newest direction. This is called "Abstract Archway". I love this next piece by Lynne Harrill who dyes her own fabric and did so for this piece. This next piece - "Fanciful Flowers" by Kate Weston is wonderful to see in person - great color and beautiful machine quilting. This next quilt by Connie Brown, one of her "Target" quilts is one of my favorites. I love her use of color, so many blocks - each different and all work so well together. It's enormous; I couldn't get back far enough to photograph it in its entirety. This last one by Dort Lee - "Spring Creek" gathers its' inspiration from the wonderful views on Dort's 50 acres of pastures, streams and forests. While at the Asheville Quilt show over the weekend, besides seeing wonderful quilts, many people wore their finest quilted vests and jackets, also great to see! A couple of very cool "fashion statements" caught my eye - One was these wonderful "leggings" - loved the swirls of color - really wild! And the other was this wonderful skirt made by Carol Sloan. Carol got the idea and pattern from the book - The Alabama Stitch by Natalie Chanin. Carol and I both saw an exhibit a while back at the Front Gallery. It featured unique wearables and some items made using this technique from this book. Carol used a knit fabric, basted the 2 layers together and did a reverse applique. She was able to carry the individual panels with her to work on. The stitching became one of the design elements, including the "knots" and "tails". It was wonderful to see in person and looked very comfortable and great on Carol. It was great fun to see the fashions as well as the quilts!